A waterbased, all-surface, acrylic coating for application on ceilings and walls, particularly large commercial and industrial applications. Elite Dry Fall is a very practical coating which is intended to be spray applied. Elite Ultra-Ceil Dryfall is specially formulated for spray application to interiors in commercial and institutional premises, especially interior cladding. The over-spray turns to dust before hitting the floor, reducing the time spent on clean-up and masking. 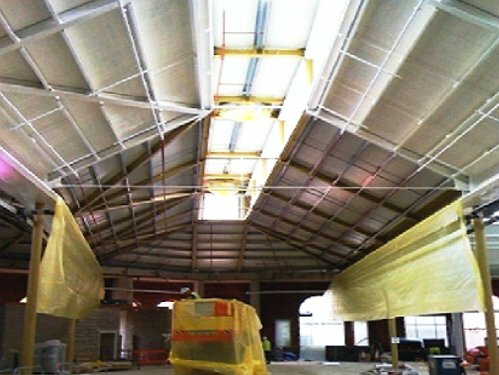 Elite Ultra-Ceil Dryfall can be applied directly onto most substrates including bare galvanised steel, interior cladding, structural steel (spot priming of rust is required prior to application). HVAC trunking, PVC, powder coated substrates and pipe work. Thinking of using several different types of paint for that job? Forget it. Elite Ultra-Ceil Dryfall will almost always do everything you need. 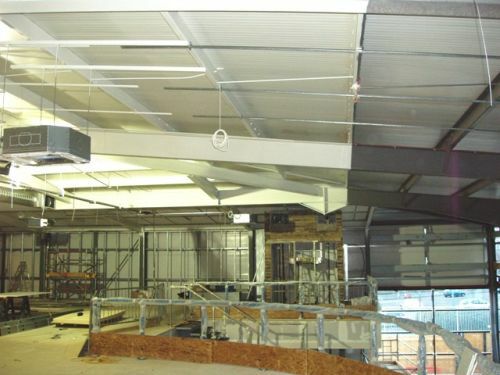 Interior cladding, galvanised steel, Metal-Pan ceiling tiles, drywall, plaster, metal & concrete, walls and primed structural steel. Do not dilute, product is ready for application by airless spray. Apply Elite Ultra-Ceil Dryfall onto substrate. Use airless spray with tip size .013 to .015 with 12 inch fan. Apply Elite Ultra-Ceil Dryfall overlapping each pass of sprayer by 50% to ensure uniform coverage. On completion of spraying leave overspray at least 20 minutes to settle before de-masking. Clean machine and equipment with warm water, ensure the area is clean and ready for re-occupation. Spread rate 6-10m2 per litre depending on substrate.